So glad you had a such a great holiday weekend. And those sunsets. My Good Lord. What a treat! I stopped reading Real Simple a while ago because it just stresses me out. I know it's an amazing magazine (I think I may have mentioned this before) but instead of using it for ideas and inspiration, I just end up beating myself up about the fact that my bathroom cabinet is just never gonna be that tidy. One of the things that drove me crazy about Real Simple is the 'New Uses for Old Things' section. 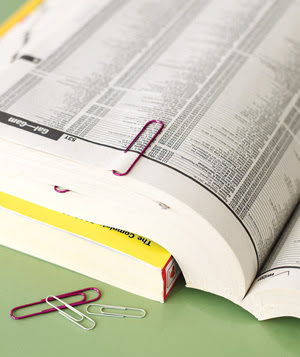 I remember reading that a good new use for a paperclip is to make it a bookmark. REALLY!? That's all you got? And who uses phonebooks??? (Sorry, Mom) I know some of the ideas are terrific, but the paperclip put me over the edge. So, since my abstention from Real Simple, I have been collecting my own good ideas on Pinterest, my new favorite place to kill time, procrastinate and visit things I covet but can't afford. You can visit my Good Ideas page here. What do you think? What do you think? Do you have any new favorite 'good ideas'? PS... 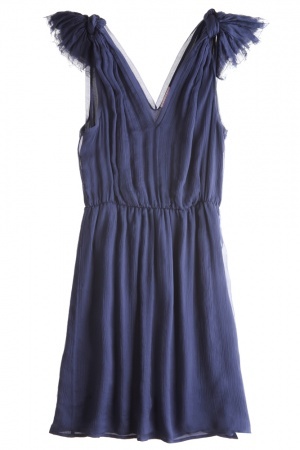 I just ordered this dress from Calypso St. Barth on mega sale (50% off already reduced). I've never ordered from them before and I can't wait to see if it works! Love these ideas! Especially the paint chip key chain. Thanks for sharing!